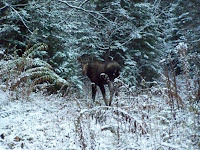 As I've mentioned a number of times, moose are making a big comeback in the Adirondack North Country of upstate New York. Apparently, these mellow creatures like hanging out in the wet, boggy section of the Cascade Ski Touring ski trails (I'm glad someone likes that section) along Route 73, outside the Village of Lake Placid. Two bulls and a cow have made themselves comfortable in the neighborhood. It is pretty neat to have the moose around, but I am supposed to remind everyone to be careful driving; hitting a moose can do a world of hurt to a car and those inside. Oh, and it is ILLEGAL to shoot a moose in New York State. Thanks to Penny for today's photo of Mrs. Bulwinkle.